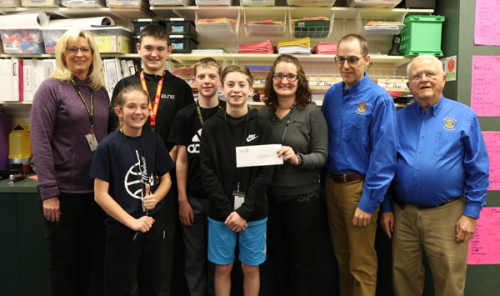 Members of the Rotary Club of Andover surprised four educators and groups at Andover Public Schools Tuesday with $500 grants to help complete projects that align with the Rotary’s mission. This is the first year for the grants, which had the goals of teaching the value community service, leadership and volunteer involvement. Rotary President Alison Couey and Past Presidents Tom Taylor and Mike Thompson made the presentations. Shanie Rucker, Robert Martin Elementary School, Recycling for Research. 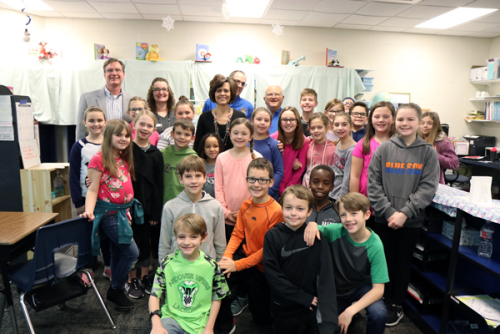 Fifth-grade students of Robert Martin Elementary will lead their school in a recycling program while partnering with the Dragon Master Foundation. This real-world experience will provide an opportunity for students, grades Pre-K through 5, to recognize the importance in recycling, community service and the Kansans Can School Redesign process. Studies show that children and adults who volunteer and serve others show more empathy and respect toward others as well as establish a greater sense of self. In addition to bettering the community through providing ways to recycle, students will have the chance to complete a survey to share their experience and how the project impacted them on a personal level. Cottonwood Elementary Student Council (Jill Hodge, sponsor), Bags of Love. The Student Council of Cottonwood Elementary has organized a toy drive to help children ages newborn to 17 that have been admitted to the Wichita Children’s Home. All Cottonwood students have been collecting a variety of toys while a local basic-needs pantry is providing hygiene necessities. The Student Council will create 100 “Bags of Love” with the donations for the homeless, abused, neglected, abandoned or runaway children in Wichita. This project’s ultimate goal is to teach student leadership, complete a service project, and learn the importance of giving back to the community. 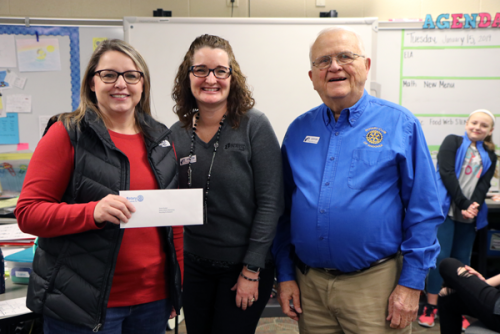 Andover Central Middle School Student Council (Kacy Bookout and Bev Carpenter, sponsors), meal delivery. Andover Central Middle School Student Council members will package 3,200 meals that will help fight hunger locally and internationally. These participants will work with volunteers from the Andover Food Bank, Sunshine Children’s Home and Numana, Inc,. to organize this project, measure ingredients, and pack and deliver meals. This project’s goal is to educate students about hunger and foster leadership, and to provide a hands-on opportunity to build unity. 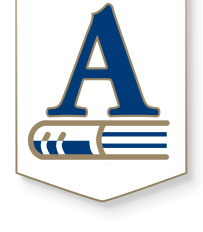 Students will complete a reflection and present at an Andover Rotary meeting. Andover Central High School Kindness Club (Angel McGill, sponsor), tie blankets for the homeless. 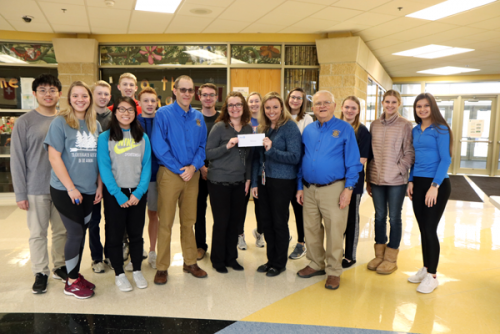 Members from the Andover Central Kindness Club will volunteer to create warm, tie blankets for the homeless community through the Salvation Army. This club hopes to impact the community through not only donating blankets but also hand-crafting them, which takes time and allows for maximum warmth for the unbearable cold months. These students will have the opportunity to create and donate blankets as well as feel a sense of fulfillment from giving back to individuals who are in need.